Tera-Byte Dot Com Inc. is offering consulting and technical services to allow for growth and overall cost reduction in the wireless high-speed Internet industry. With over 22 years of IT experience, including over 10 years in the fixed wireless industry, we are uniquely qualified to assist in optimizing customer management and support, as well as offer technical expertise for systems development. During our tenure in the industry, Tera-Byte has supported the growth of 9 fixed wireless networks with over 10,000 combined clients. Using our unique scalable custom solutions, we have been instrumental in the development of networks from the ground-up, as well as providing expert services to already well-established networks. With our expertise, these networks were able to reduce overall downtime, increase customer satisfaction and increase sales and revenue. With our many years of industry experience, we have developed custom solutions that have a proven track record for many services required by the industry. CRM, Billing, Network Monitoring, Email, Scheduling and Dispatch have all been fine-tuned to operate as an integrated and cohesive unit across our platforms. Tera-Byte has developed a unique and custom integrated CRM solution, specifically designed to handle the data related to high-speed wireless Internet service. Our custom database manages customer records and interactions, and allows support and management to get meaningful and vital information whenever necessary. A custom front-end solution can be implemented to allow for a variety of views tailored to specific tasks, such as billing, technical support or onboarding. This system integrates directly with network monitoring and support to provide real-time information to technicians regarding network availability and performance as it pertains to the customer in question. Having all the relevant information at their disposal, support technicians are able to provide the best customer support possible without having to rely on separate systems that may take time and effort to aggregate. Directly integrated into our CRM system is billing and invoicing for all customers. Our monitoring platform automatically generates monthly invoices for customers, and imports usage statistics for any over-bandwidth charges should they be implemented. The system is extremely flexible and customizable on a per-customer / per-charge basis. Summaries at the end of each billing cycle are available for importing into standard bookkeeping software such as Quickbooks. Tera-Byte provides 24-hour live support via our team of experienced and highly skilled technicians. As each tech is fully versed in all aspects of the network, they are able to troubleshoot customer issues directly, without having to rely on escalation or support personnel. This results in overall less hold times for customers, as well as much higher customer satisfaction as issues are typically resolved on the first call. Integrated network monitoring gives real-time information about the state of the wireless infrastructure. 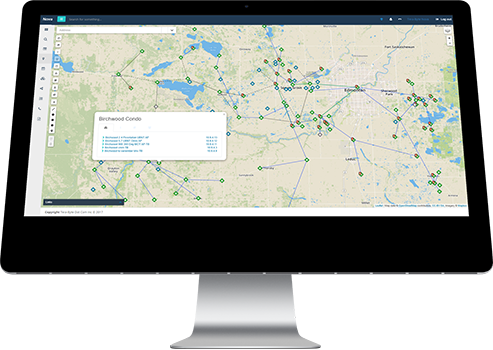 A map-based layout allows for easy visualization of tower locations, as well as any network segments that may be experiencing service disruptions. A hierarchical view allows technicians to determine what locations are interrelated and gain visual insight into possible sources of network issues. A custom ‘rrdtool’ based monitoring system records constant data about all managed network elements, including customer devices. This data can then be converted to visual graphs that provide insight into network trends with retained data for a 2 year period. Immediate visual feedback allows customer support technicians to provide informed answers to customers regarding their connection speeds and usage down to a 5-minute window during the last 24-hour period. These graphs can also be aggregated into weekly and monthly views to provide an overview of network events that may be affecting multiple clients in an area. As technologies evolve, our technologies are able to keep pace with new developments as they are fully customizable to your network’s needs. Multiple access platforms are capable of being integrated into our solutions, including WiFi, WiMAX, and LTE. Non-wireless connections can also be managed through the same system, including DSL, and GPON fibre. 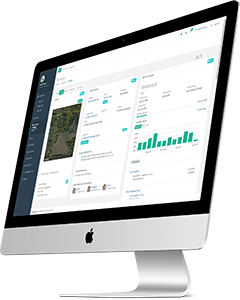 Integrated into the custom CRM platform, a specifically designed scheduling and dispatch system allows for rapid response to customer and network issues. As wireless networks tend to cover vast distances, multiple technicians are able to be scheduled depending on service area. Scheduling takes into account drive times between appointments to give the most accurate estimate of arrival times. A special learning algorithm is used to calculate work durations for appointment types, ensuring there is plenty of time allotted for customer service tasks. Accompanying the scheduling system, iOS and Android apps track daily progress and provide technicians with all the relevant information they require to provide the best service to the customer. The app is customizable to business needs, and provides offline functionality should there be limited cellular data coverage.